Speaking engagements are a great way to grow your platform and share ideas. But are speaking engagements for everyone in business? To answer this question, I want to share the impact public speaking has had on my business. If you told me five years ago that I would be speaking in front of a large audience about how to start a business, I would have never believed you! It's rather surreal to think that not too long ago I was working a corporate job that kept me financially secure, but didn't exactly keep me feeling content. I had bigger dreams in the pipeline that I wanted to pursue, but that would come at a price – quitting my job and starting out on my own. When the time finally came to give up my corporate career and venture into the unknown, it was one of the most difficult decisions I've ever made – but it transformed my life and developed my character in ways I never imagined. The more my business started to flourish and the more attention I got from clients, the more people wanted to hear me speak at large events, in front of big audiences. 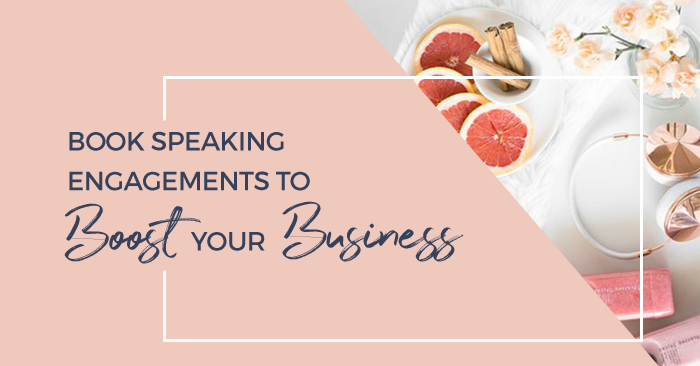 One of the biggest lessons I’ve learned since starting my business is that speaking engagements are one of the best ways to establish yourself. They give you instant credibility. If you still don’t believe me, here are a few ways speaking engagements can have a positive influence on your business. There is no denying that self confidence comes in different forms, but public speaking is one of the best ways to challenge your fears and slay them! It's impossible not to feel great after giving an impactful speech that you were initially quite nervous about. Not only does it feel great, but your general conversational skills will improve. You'll be better able to develop your ideas and express them to an audience who is looking for a quick and easy way to understand, process, and adapt those ideas into their own life. Even if you’re just starting out, public speaking is a powerful tool because it can help you better relate to your intended target audience. One of the best ways to sell yourself to an audience, or let someone know about a product or service you provide, is through speaking, and in person is even more powerful. If you're starting your own business, it's wise to explore this avenue because it’s one of the best ways to effectively communicate your message to more people. People want to see someone who is thriving, has an engaged list of clients, and is living proof that if you continue to work at your dreams they can definitely come true. You'll be your best asset, and the way you choose to present yourself through speaking engagements and on social media is how your audience will relate to you! Do you feel passionate about a certain topic and want to share your knowledge to more people? Speaking in front of an audience is probably the most effective way (not taking social media into consideration) that you can demonstrate your knowledge about a certain topic. Just think about it; sometimes we remember the way people said something face to face, rather than how we saw it written in an article or a post online. The delivery is so important, so make sure that you are using clear and concise language when speaking in front of any type of audience – whether it's a small group of people, or an entire room who are willing to listen and appreciate what you have to say. Networking is one of the best ways to get your voice out there in any given field, but sometimes the process of putting yourself out there can feel awkward and scary – just like making new friends. This is just another place where speaking engagements come in handy because they are fantastic ways to network and easily meet new people to expand your inner circle. Speaking to a larger group of people will make it that much easier to get your ideas heard to a wide audience, and at that point you'll have a common ground of conversation to get the ball rolling to get an instant conversation starter. Trust me, it’s one of the easiest ways to meet new people and get connected with like-minded people who can strengthen your business circle. How can you book speaking engagements? One of the most frequent questions I get about speaking arrangements and talking to a large group of people at events is, how did you get the opportunity? And while a lot of it can come down to networking and increased exposure over the last few years, one of the best tips I can give you is to put yourself out there and play a part in making it happen. One of the easiest ways to book your first speaking engagement is to actually host one yourself. This could be in the form of a workshop in your local community aimed at targeting people who share the same interests and values as you do. It doesn’t have to be something on a large scale; any size workshop is a fantastic way to get your name out there. You can essentially host a webinar, but in person! Who knows, someone might hear you speak, recommend you for another speaking engagement, or go on to buy your program or work with you 1:1. Another simple way to lock-in more speaking engagements is to let people know that you're available and interested in them. Opportunities could go to someone else who wants it more. Make sure you're actively putting yourself out there, whether you're meeting people face to face at events, or simply posting regularly on your social media about your interest in going to events and speaking. In terms of your online presence, let your audience know your availability by creating a special speaker page on your website. Add the essentials such as image or video content of you at previous engagements, a list of suggested topics you love to discuss with your audience, and finally include an online form or email address where you can be reached if people would like to know more about you. We are our best asset, and speaking engagements are just one of the methods to show our ideas and services to a greater audience. Although it might not be one of the easiest things to do, good presentations can create lots of positive hype about you or your business. Apart from the rapidly growing online world, word of mouth is still one of the best ways your potential clients can find out about you, what you stand for, and the products or services you offer. Why not give it a go and see how you enjoy it! IT GIRL RADIO EPISODE #79: Rosie Freiha - What to do when you’re unhappy in your business?